Rênes de brutosaure de caravane puissant is the "upgraded" BfA version of previous Vendor Mounts and comes equipped with an Auctioneer. Rênes de mammouth de voyage de la toundra from Wrath of the Lich King - sold by Mei Francis in Dalaran. Rênes de yack de la grande expédition from Mists of Pandaria - sold by Oncle Poche Profonde in Kun-Lai Summit. For anybody else who has been having trouble finding him, the location currently shown on the map is completely wrong. has been corrected and now shows the right spot. He's near the center of the Boralus map, in the orange area just north of the middle bridge, down by some aggressive mobs. The location wowhead has marked for this NPC is currently incorrect. This NPC is in Tiragarde Sound , located in the town Boralus in the location called, Hook point. 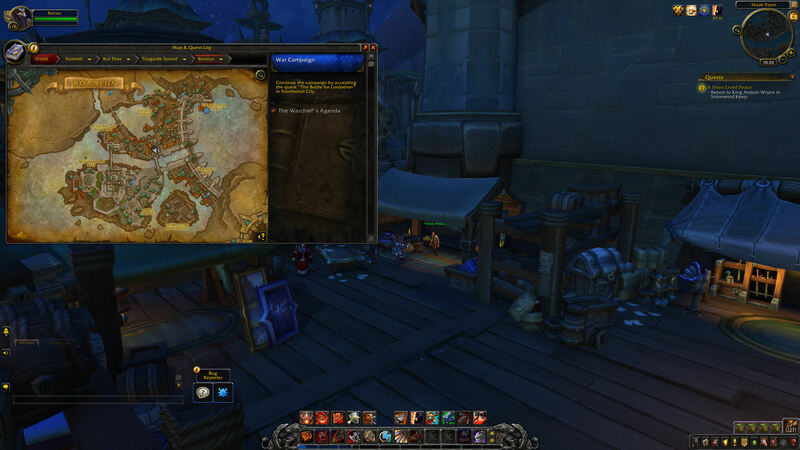 Open the Map of Boralus, there are two bridges. This NPC is located on the northern side of the eastern bridge. This "bridge", will be the one directly south of the "Ashvane Docks" on the map. He is just a few steps south of "Madam Gosu" of the BMAH. Also in Beta, apparently you can grind rep and get the cost of all items he sells by 20%. This may not go live, but it might. So grinding rep to save 1 million gold (if buying brutosaus) maybe worth it to some people. I will be buying the AH mount, the day BFA goes live at full price, not gonna bother with rep, I want this too badly. here's a pic of where Tricky Nick actually is, currently the WoWhead location is incorrect. until they update it, I have provided a screenshot of me next to the vendor and with the map open so you can see approximately where he is located. He's at 56.7, 47.0 in Hook Point, Boralus. This guy is making A LOT of gold at BfA launch! The reputation discount for his items did not go live, it still costs the full amount for everything. Location is 56.7 46.3. BMAH is right next to him. Mobs can be hostile. For Alliance (b4 flying or w/out "Pathfinder"), getting to Nick le cynique (as well as Madame Gosu) in Hook Point can be done without having to aggro or fight any mobs. Near the Flight Master in Boralus, head south down the stairs (Boralus 67.4 16) and follow the easternmost pathway through the Dampwick Ward until you reach the water (Boralus 65.4 44.8). Turn right/west and head into the structure ahead of you (Boralus 57.7 49) and up the interior stairs. At the top of the structure, face north and look down: There's Madame Gosu, and Nick le cynique is just south of her, to her left out of sight under the open tent (Boralus 56.7 46.3). Jump over the railing (or on to the green-roofed surface to your right) and drop straight down (fall damage is minimal). Edit: In the video posted by Tapichka, the paths we propose are almost identical, the difference being that I suggest you go up the stairs and drop down, whereas Tapichka shows a ground path through and around the structure. In the video, Tapichka does aggro the mobs lying in wait just b4 you reach Nick le cynique.